On the night of April 3 and 4, 2011, Saturn will be in opposition, located directly opposite to the sun in the sky. This story was updated March 31 at 1:32 p.m. ET. The ringed planet Saturn is back in the evening sky. Saturn reaches opposition – the time when it is exactly opposite the sun in the sky – on the night of April 3 and early morning of April 4. One side effect of this is that Saturn is now in the sky all night long, rising in the east as the sun sets, and then setting in the west when the sun rises. As a result, Saturn is not as bright as the other naked-eye planets. This sky map of Saturn shows where to find the ringed planet in the evening sky. Here's another way to find Saturn: Follow the arc of the Big Dipper's handle to Arcturus and then speed on to Spica. 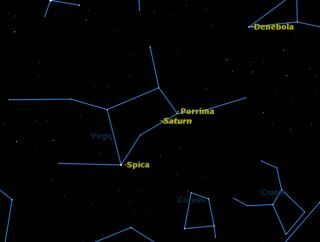 Make a sharp left at Spica and there you will find Saturn. Almost every amateur astronomer remembers Saturn as one of their first views through the telescope. Although much smaller than most people expect from the pictures they’ve seen, Saturn with its rings is a uniquely beautiful and captivating sight. Seeing the rings requires a telescope magnifying at least 20 times, but Saturn can handle just about any magnification above that. For the last two years, most people have been disappointed because Saturn's famous rings have been "edge on" to Earth. Saturn’s rings are tilted towards a particular point in the sky so that as Saturn travels in its orbit around the sun, sometimes the rings are presented towards us and at other times they disappear when the Earth is in the same plane as the rings. Having been next to invisible for the past two years, the rings are now revealing their northern surface towards the Earth. In a telescope, look for the dark division between the main inner and outer rings. This is named Cassini’s Division after 17th century astronomer Giovanni Domenico Cassini, who first discovered it. Cassini also discovered Saturn's four brightest moons, all of which can be seen in a 4-inch telescope. He was particularly interested in the moon Iapetus which showed interesting variations as it moves around the planet. Cassini correctly surmised was due to one hemisphere being darker than the other. This was recently confirmed by NASA's Cassini spacecraft, which is named for Giovanni, and is currently in orbit around Saturn. Saturn’s largest moon, Titan, is the only moon in the solar system with an appreciable atmosphere and is readily visible in any small telescope. The smaller moons come into view with larger telescopes.